This is going to be my first entry on the FootballOutsiders.com column entitled "Under The Cap." So in short, Stafford is guaranteed to make at least $41.7M over the first 3 years of his contract. If he were to be cut after Year 4 he would have made at least $49.5M. Over 6 years, he’s going to make at least $72M, but could earn a maximum of $78M over that same term. In any negotiation, the best deals are those in which both sides feel like they walked away with a deal they can feel good about; the Stafford deal is definitely one that falls into this category. From the perspective of Tom Condon and CAA, if your primary interest is maximizing your client’s guarantee money, then, simply, the fact that you got your client the most lucrative rookie contract in history bolds well for your future recruiting of the next Stafford (hello, Sam Bradford). Moreover, the fact that you got your client $12M per year; while Jake Long from a year ago got $10M/year and Matt Ryan got $11M/year, also bolds well for your argument. 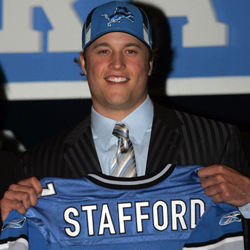 From the perspective of the Lions, you knew going into it that you were going to pay a King’s ransom for Stafford. However, you can feel good about getting a deal done ahead of the draft (unlike JaMarcus Russell) and maybe more importantly you can feel good about limiting the increase of the “% Increase” of the guarantee to only 1.5% from Long’s 14.3% and in exchange for this you’re willing to give up a higher per year base contract value ($12M/year for Stafford vs. $10M/year for both Long and Russell). Just as agents are interested in maximizing guarantee money, clubs are interested in limiting it in anyway possible; relatively speaking, Detroit did a good job in this regard. You see that Stafford’s increase was 1.5% more than Long’s; however, last year’s premier rookie QB, Matt Ryan got an even higher increase than his predecessor at #3. Ryan’s increase was 3.3%. As aside, looking the last three #3 overall picks, Tyson Jackson should be going to the Pro Bowl as a rookie. So maybe Sanchez gets a 6 year contract with at least $25M guaranteed ($4.17M/year of guaranteed money). We’ll see…. I'm confused about the NLTBE bonus. Is that money counted as guaranteed even if it isn't likely to be earned? Yeah, it's considered guaranteed money, as typically the incentive is backed up by P5 guarantees. Once this 1-time NLTBE incentive is earned, those P5 guarantees go away. So why even have an NLTBE bonus if it's backed up by a P5 guarantee? My simple mind can't seem to understand that part. I mean if he never reaches any of those incentive bonuses he still gets that money, right? So what's the benefit of doing it this way? Because if the player earns the 1-time NLTBE (which he typically will; they're included with the expectation that they'll be earned), that's additional money on top of the P5. The "guaranteed" aspect of the bonus may be backed by a P5 guarantee, and that guarantee voids once the bonus is earned, but the P5 itself does not reduce as a result. Oh, and the benefit to the team of doing so is that it's another mechanism that allows them to pack more money into the deal within the constraints of the rookie pool and the 25% Rule. Incentive money does not count toward those restrictions, so crafting a bonus that as a practical matter is easy to earn, but is technically NTLBE according to the CBA is a way around those limits.